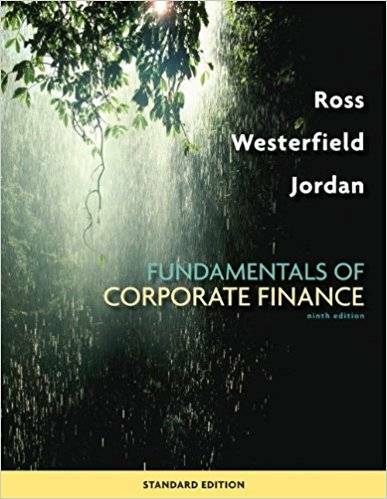 Stephen A. Ross, Randolph W Westerfield, Bradford D Jordan, "Fundamentals of Corporate Finance (9th edition)"
The best-selling Fundamentals of Corporate Finance (FCF) is written with one strongly held principle– that corporate finance should be developed and taught in terms of a few integrated, powerful ideas. As such, there are three basic themes that are the central focus of the book: 1) An emphasis on intuition—underlying ideas are discussed in general terms and then by way of examples that illustrate in more concrete terms how a financial manager might proceed in a given situation. 2) A unified valuation approach—net present value (NPV) is treated as the basic concept underlying corporate finance. Every subject covered is firmly rooted in valuation, and care is taken to explain how particular decisions have valuation effects. 3) A managerial focus—the authors emphasize the role of the financial manager as decision maker, and they stress the need for managerial input and judgment. The Ninth Edition continues the tradition of excellence that has earned Fundamentals of Corporate Finance its status as market leader. Every chapter has been updated to provide the most current examples that reflect corporate finance in today’s world. The supplements package has been updated and improved, and with the new Excel Master online tool, student and instructor support has never been stronger.